I’m marking all kinds of things off my April to do list today! The Hexagon Flowers and 9 Patch top is assembled. I love it when I’m working on a small top and I can use my big ironing board to measure and pin the borders. It’s so much easier than crawling around on the floor! I won’t quilt this one right away but since it’s my oldest UFO, the plan is to get it done this year. 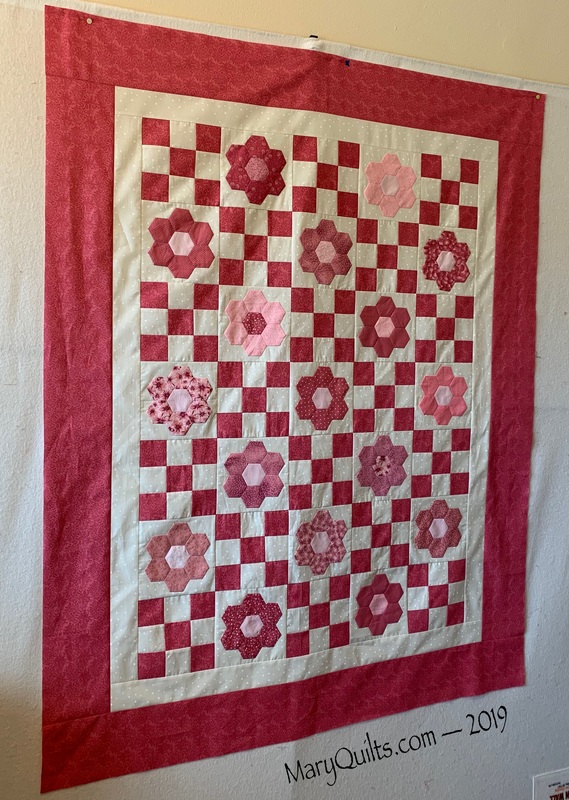 Those paper pieced Hexagon Flowers waited a long time to become a quilt! I like that you used different pinks for the hexies. This turned out very nicely. You’ve been very busy! The hexie quilt is so sweet. Some little girl will LOVE that one. It turned out to be a beautiful top. It will be loved. It’s lovely! Congratulations on finishing this top in April. You have been very busy! Beautiful quilts!! I’m trying to remember but did you hand sew the hexies on the background? I have some that I’m going to match with vintage butterflies.